When you head over to a nursery, and see bees and butterflies and other pollinators foraging on the plants, that's a good sign. Promise: The pollinators will come. 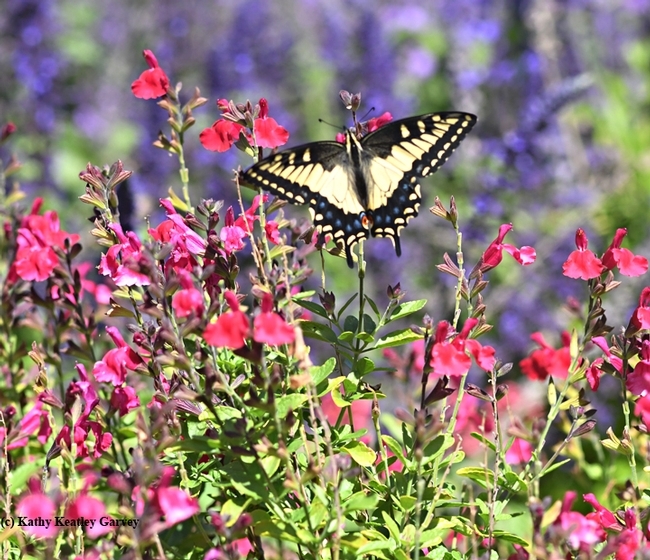 Many gardeners and would-be gardeners are looking forward to the UC Davis Arboretum and Public Garden Plant Sale--the "first entirely open-to-the-public plant sale of the fall season." It's set from 9 a.m. to 1 p.m., Saturday, Oct. 13 in the Arboretum Teaching Nursery on Garrod Drive, near the School of Veterinary Medicine. Members of the Friends of the UC Davis Arboretum and Public Garden and the Davis Botanical Society receive 10 percent off their purchases. You can join online, at the door, or call ahead, officials say. New members receive a $10-off coupon as a thank you for joining. What plants are they offering? Download the inventory. Meanwhile, summer has ended, fall crept in on Sept. 23, and winter is fast approaching--Dec. 21. We caught a little sliver left of mellow mornings last weekend in the Kate Frey Pollinator Garden at Sonoma Cornerstone. An anise swallowtail, Papilio zelicaon, fluttered in, touched down to sip some nectar, and soared off. What a sight to see! Buy a plant (help the UC Davis Arboretum and Public Garden), and promise, the pollinators that will surely come are free!